Although it's a popular symbol in today's modern culture, few know exactly what the yin yang symbol truly represents. Yin and yang is present in feng shui imagery, and among other things, it represents balance and harmony. The yang side - This is the light side of the symbol and represents the positive. This side of the symbol is said to be the masculine side. The yin side - This is the dark side of the symbol and represents the negative. The yin side is also considered the feminine side of the symbol. 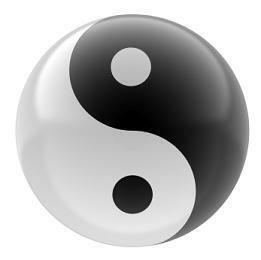 Not mutually exclusive - The black side and the white side of the yin yang are not mutually exclusive of one another, meaning, the black side cannot exist without the white side and vice versa. Both sides of the symbol are necessary in order to achieve balance. To improve your personal chi flow, a feng shui practitioner may recommend a yin yang pendant, bracelet or medallion. To improve positive chi flow in the workspace, use a piece of yin yang art. This art can vary from canvas paintings, drawings, statues and figurines. Regardless of how you decide to use the yin yang, there is no doubt that in today's warp-speed paced environment; everybody could use a little balance in his or her lives.